As the summer months roll on, we continue to spend more and more time outdoors. This is what it's all about. With long summer nights and the lazy sunny days, the outdoors beckons us at every hour. There are few better ways to spend your summer months than designing and constructing a beautiful outdoor oasis. With a beautiful outdoor space to lounge, entertain, and live in, we can find an entirely new dimension to our home's appeal. While many people spend months and years constructing and designing the interior spaces of their homes, we can often overlook the potential outdoor spaces have in a home. Of course, the initial landscape design and natural environment play a huge role in the character and layout of your yard and outdoor areas, but your oasis does not have to stop there. Incorporate these essential elements to build a beautiful and peaceful outdoor oasis for your summer relaxation and fun. Seating is one of the most important elements in any home's outdoor oasis. With good seating options, you can transform a back patio or deck into a truly relaxing outdoor room. Think of creating several different seating options for yourself and guests to experience your outdoor space entirely. Have a table and chairs for dining, a hammock for lounging, and chairs placed next to the blooming garden. With multiple options and functions of seating, you can better utilize all that your outdoor oasis has to offer. Be sure you consider external elements like sun, shade, and sound when planning our backyard seating. You should utilize the natural shade your space offers as well as completing the seating areas of umbrellas or canopies. Think about placing seating options near trees and other natural shade elements. Also, consider what sounds and sights your seating arrangements will allow. If you dream of a water feature in your space, think about placing your lounge seating near the water for a peaceful trickle as you laze. Comfortable and natural seating is vital to a fully functioning outdoor space. 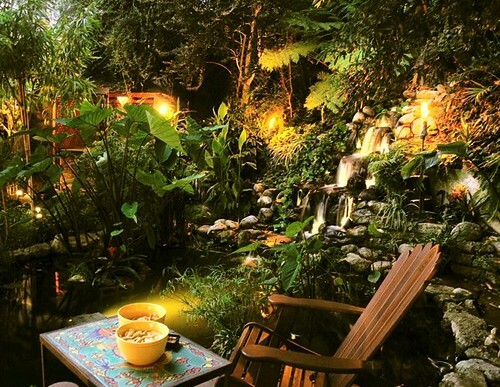 Lighting is essential to an outdoor space. While I touched on this some in the previous point, it is important to consider lighting elements for all points of the day and for other seasons. Creating a wonderful outdoor space with a fire pit or ceramic chimnea can be a great centerpiece to your space. These features provide natural lighting for a space and act as major pieces in your overall design. You may also want to consider solar lighting options for other aspects of your oasis. Place small solar powered lanterns around your flower garden, pond, and sitting areas. Use elements of light to highlight the primary features of your outdoor space. Ponds and fountains are usually some of the biggest hits in outdoor spaces. Everyone loves a peaceful pond with lilies and goldfish or a trickling fountain with movement and life. 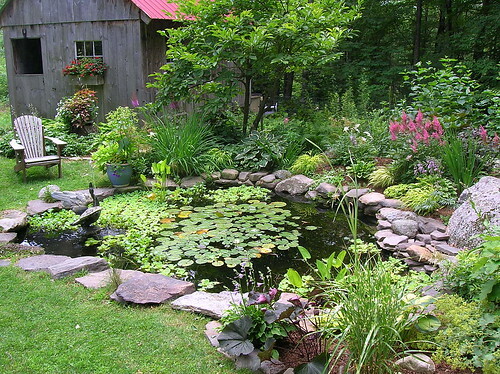 Ponds can be a really fun element of an outdoor space to plan, construct, and design. Whether it's a simple small pond with a few water plants or a large pond with a bubbling waterfall, many people choose to create this water element themselves in their backyards. A water feature helps take an outdoor space to the next level of majestic and transforming. Work to create a water feature that feels natural and comfortable in a space. You want to use elements that feel appropriate for your yard and space—consider the types of plants, colors, and materials you use carefully. There are so many types of gardens to consider for your outdoor space. While building an outdoor oasis is very much about creating something aesthetically appealing, it should also be about function. Consider starting a vegetable garden in your space. Depending on what climate you live in, things like squash, tomato, and zucchini can be wonderful for cooking as well as adding color and interest to your space. Veggies can take some effort to maintain, but the payout is usually much greater in the end. Also, consider starting an herb garden in your space. Growing things like mint, basil, thyme, and more can be very simple and can add an aromatic element to your outdoor oasis that is hard to beat. Of course, aside from the more "exotic" veggie and herb garden, you want to great a flower garden and plant garden. Think about the plants and flowers you use. Consider your climate carefully. Pick things that are natural for the environment in which you live to add texture and vibrancy to your space. Familiar with the industry, Kristie Lewis knows that not all construction management careers are the same. Read her posts to gain a better understanding or contact her directly at Kristie.lewis81@gmail.com.